“Slump” pain is the result of mild inflammation of the central neural tube soft tissue structures, the dura. Patients will often report gradual onset cervical, mid thoracic and/or lumbar diffuse pain or aching while sitting for prolonged periods. Bilateral mild to moderate headache which lasts for several days may also be a symptom. These patients will often have a mildly positive slump on assessment with pain or tightness reproduced in the lower neck, mid thoracic and/or the upper lumbar region. 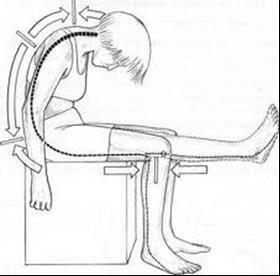 As a result of this tightness, when sitting for a period of time in the slump position, the constant stretch on the tissues irritates the dura causing the aching to commence. The addition of straight leg raise (SLR) to the slump test position may or may not increase the pain during testing. SLR testing alone may not be significant. There are rarely any signs on joint palpation although the patient may describe general tenderness over the joints and soft tissues of the spine. Sitting up in bed reading a book at night is a classic aggravating activity. Driving for long periods is also a position that may cause problems. Other aggravating activities include prolonged writing, sewing or knitting, or sitting at a computer, or any activity where the neck is positioned in prolonged flexion. Physiotherapy treatment can be highly effective in mobilising and eventually stretching out the restricted tissues and improving range of motion of the cervical, thoracic and lumbar spines generally. Postural correction exercises designed to take strain off the spinal joints and encourage good muscular support are also necessary to prevent recurrence. Continuing to sit with poor posture can prevent resolution of the symptoms and result in further weakening of the muscles of the trunk due to pain inhibition and lack of use. Patients with a previous spinal injury or who have had previous spinal surgery where scarring may be present may be more likely to experience slump pain due to dural restriction. Conditions such as fibromyalgia and Ross River Virus may also predispose a person to experiencing these symptoms. Pain is eased by any position out of the dural stretch position. The patient will tend to feel stiff in the morning, but can improve with daily dural stretches. These stretched must be progressed carefully as overstretching can cause an increase in pain, while under-stretching will result in no improvement in symptoms.